Konkoran Stalks Shoppers; Exorcises Demons from Circumcised 3-Year Olds. Mazel Tov! Senegal - Slashing its sharpened machetes together and letting out a deafening screech, the bark-clad beast known as a konkoran races through the market scattering women and children as they go about their morning shopping. Here they will find young boys who have recently been circumcised and who, according to the Mandingo people, are vulnerable at this time to attacks from evil spirits. The beginning of Senegal's rainy season and the circumcision period, in which boys as young as three will symbolically become men. 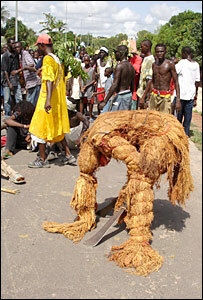 The young men of the Ndiongue family bring their newly-circumcised sons from their hiding places as the konkoran in its costume of sacred red tree bark whirls through the compound gates. With the young boys on their knees, the benevolent but violent beast circles them, chasing out the harmful spirits that are thought to cause illness or misfortune in later life. "This that you see in town, it's not the real konkoran," says the old man, dressed in a long robe and Muslim skullcap. "In the village, the konkoran doesn't walk on earth but flies. Nowadays, these kids do whatever they like."